It feels like this past year has been all about teaching in-person, Modern Calligraphy and Lettering workshops! 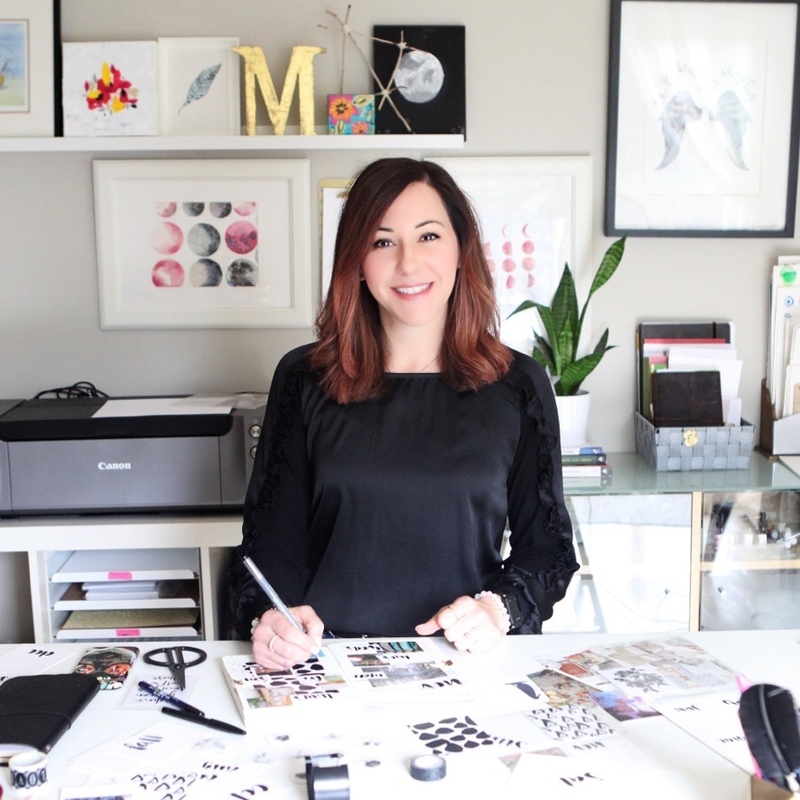 I have had a blast teaching my most favorite calligraphy style for lettering and observing how other learn, what tips I can offer to create more success for my students and just how inspired I am by others! I often thought about how I could extend my teaching and offer the opportunity to those who are not in may local area to learn my personal method of Modern Calligraphy. 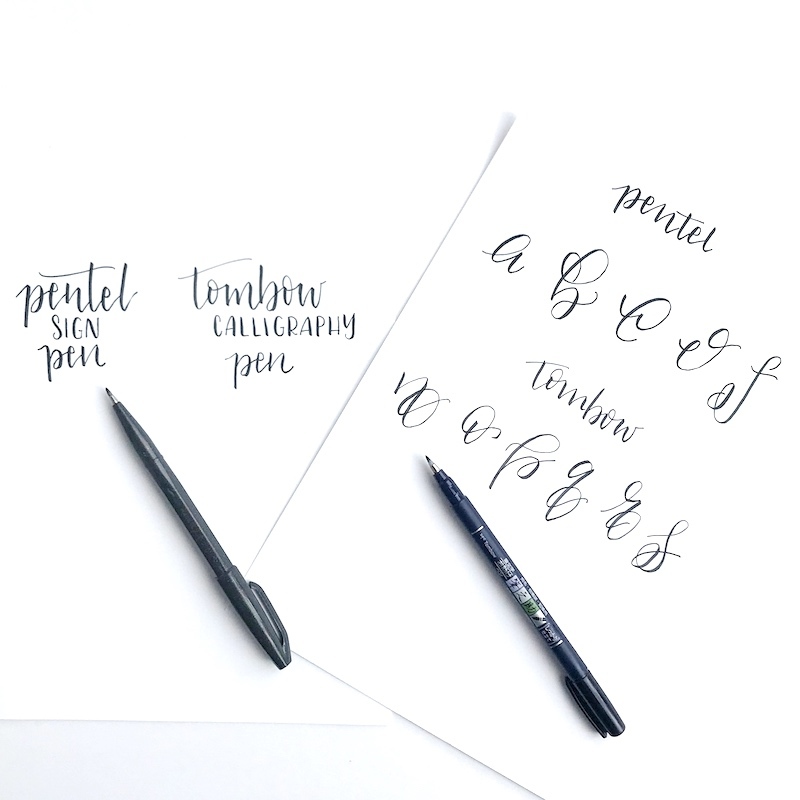 So to start, I am creating this series of posts to help answer your questions about what tools to use and how to get started with Modern Calligraphy and share everything you need to get started and to grow your skills! I’m also offering a Free 5 Day Challenge to help get your toes wet with how to learn basic Calligraphy strokes and warm-ups, to help you start your calligraphy journey. I hope that you find both the series and challenge gives you the boost you need to learn Modern Calligraphy and to fall in love with it like I have! Before you start the challenge, you need some tools!! 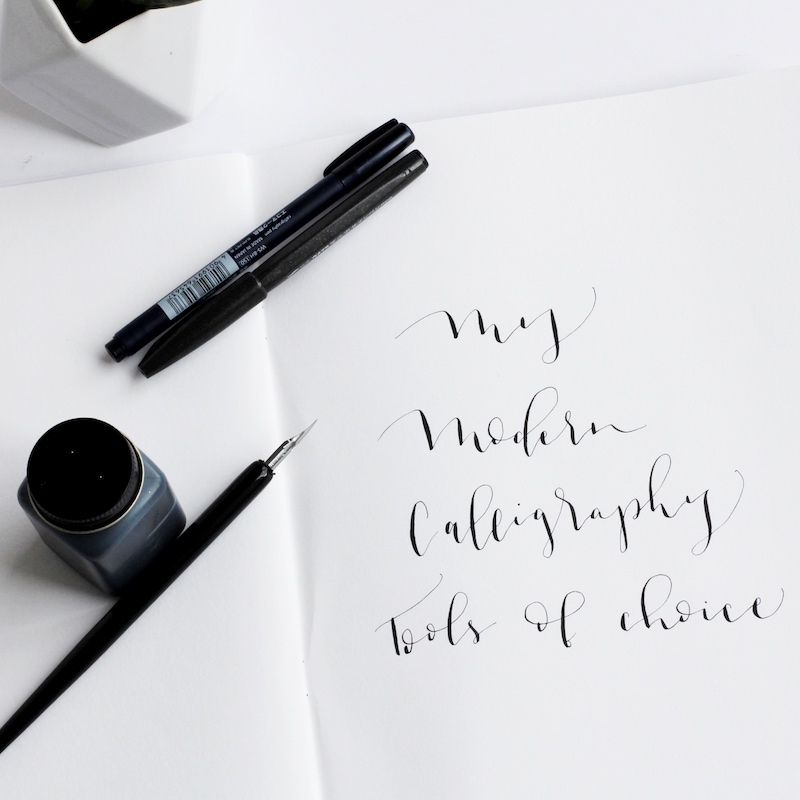 First off, what I love about modern Calligraphy is that; you don't need to have neat handwriting in order to write beautifully, you can add your own personality and style into your lettering, and with practice, you’ll be lettering confidently in no time! Keep in mind, Calligraphy is a learned skill. That means, you need to practice in order to feel more confident and to also see an improvement! You will hear and read this fact over and over again. Muscle memory is key and takes time and practice to develop. I’ve always loved lettering and writing. I would journal, write poems and words over and over again trying to make my letters looks fancy but uniform. I didn’t have neat handwriting growing up. In fact, I envied all the beautiful hand writing in class and tried really hard to make my writing look like girl next to me in 6th grade. Fast forward to university and note taking, my handwriting consisted of scratches and short forms so that I could keep up in lectures and take down notes as quickly as possible (no one had personal laptops then. I am really dating myself!). When it was time to address my wedding invitations, I bought every calligraphy pen available at the time - there were maybe 3 options back then. I struggled and strugggled and by the time every invitation was sent followed by every thank you note, I gave up! I realized that I would never write beautifully and started to type everything! Fast forward to about 5 years ago, I took one online class, I practiced, practiced, copied other lettering styles, practiced some more and fell head over heels in love for writing in my own personal lettering style. 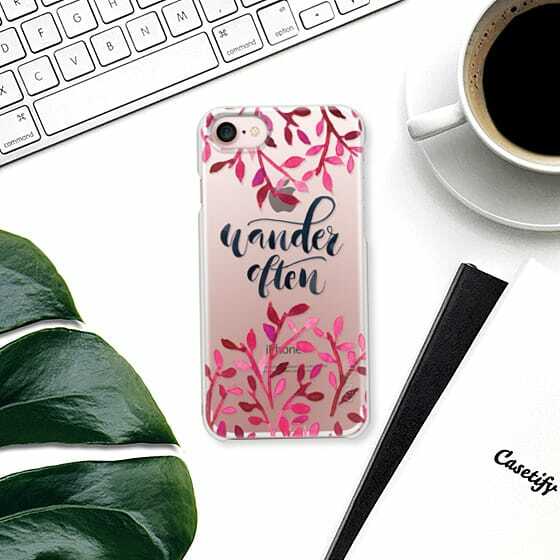 Now I am known for my hand lettering and designs for various products and apparel. I have been commissioned for difference projects and have sold out numerous in-person workshops! I still have horrible hand writing, but man can I draw letters and make them look stylized and modern! I’m hoping you’ll be inspired to start your own journey by the end of this series too! With any trade, tools are very important and will help your experience be more enjoyable but will also help you be more successful. I use a variety of tools for creating lettering for my designs and custom orders. 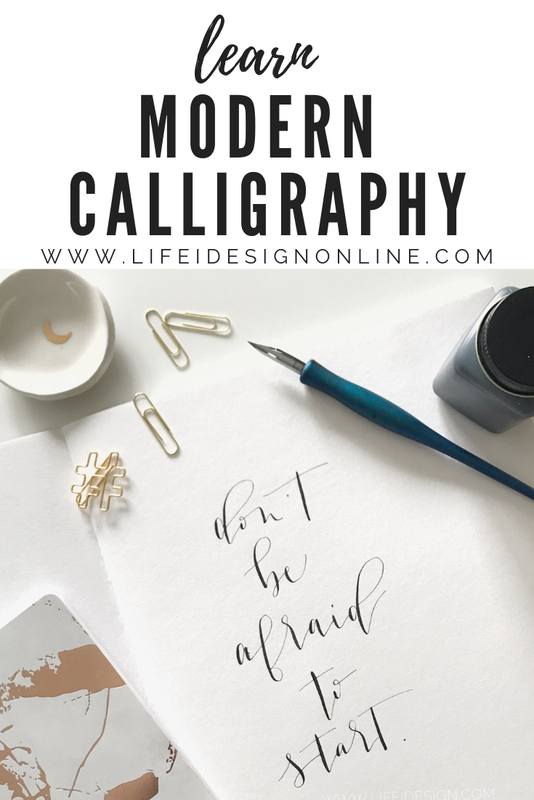 Here I will outline my top two options that I recommend for Modern Calligraphy and you can choose which one you will begin your own Modern Calligraphy journey using. Oh, and I created links for all the items on Amazon which is where I buy most of my supplies and have linked them all for you. If you choose to purchase any of the items, please note, I will earn a few cents to add to my latte fund so thank you! The Nikko G nib is a fav of mine!! I often include this nib in my Modern Calligraphy 101 student kits! I like the flex of the nib, but it is still firm and nice to letter with. I also love the Zebra G nibs too, and found these awesome gold ones that I have my eye on! I hope this one will arrive in my mailbox soon! My ink of choice to this day, is the Speedball black opaque ink. It is easy to work with, it's opaque and offers a bold black line. It's what I include in all of my student kits and recommend that you even try the large bottle and refill your own jars. I always pick up multiple pads of Borden and Riley marker paper. Hands down, my fav to work on. It's always what I give to my students and what I use myself! You can look for calligraphy parchment paper and some laser printer papers works as well. When you use a dip pen and ink, it gets messy! I am always covered in ink and sometimes my fingers are stained for days! However, it is a very intuitive, primitive and tactile experience that can be very enjoyable! It is challenging to learn how to control the pen, ink and nib when you first start, but once you get the hang of it, it is truly an experience like non-other. You must use special paper with a dip pen and ink. If you use un-coated paper, the ink will bleed and you won’t be happy with the finish. Paper can be one of the bigger investments that you will use a lot of! The tools are not available everywhere. I order most of may pens, nibs and paper online as you can see in this post however, you will enjoy the hunt! I often pick up ink wells at antique shops and dip pens when I am traveling. It becomes a fun hobby! So an alternative for you if you choose not to try the straight pen and nib option are felt, small brush pens. I enjoy using brush pens when I am practice lettering styles and playing around with designs when I want to use card stock or plain old printer paper. They are portable and easy to use however, to me the brush pens are not an authentic calligraphy experience. However, if you want convenience of having ever flowing ink, a small brush pen may be the way to go for you. I order my pens online too but have noticed that some art supply stores are now carrying a great variety of pens. Looks for pens that are called brush pens, calligraphy pens or sign pens. 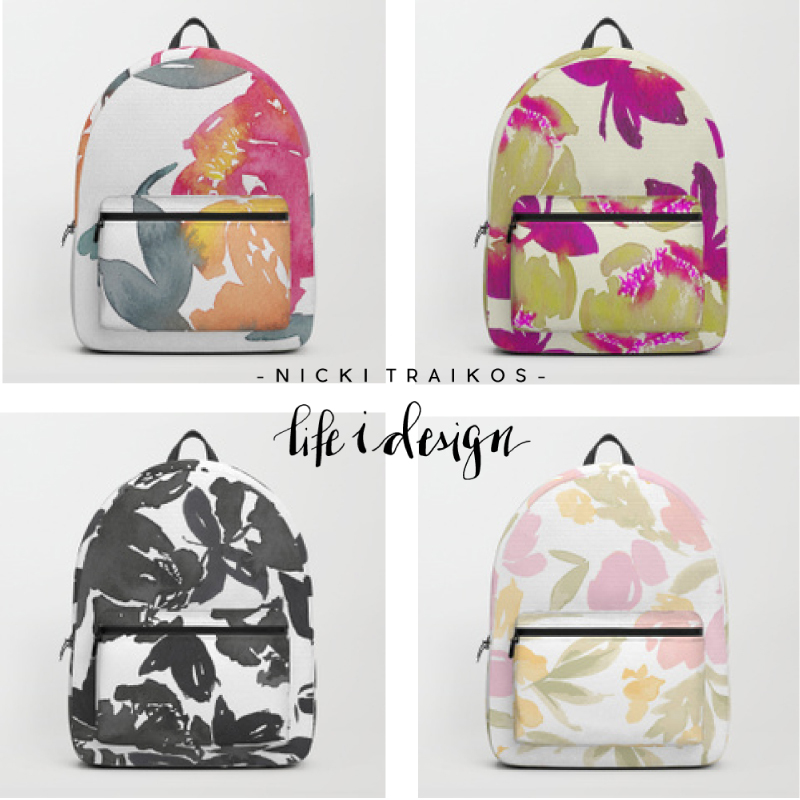 Here are my top 2 that I always reach for and have in multiples on my desk! Pentel fude sign pens offer a nice firm tip with slight flex to create the lines you need to mimic modern calligraphy style. The Tombow Fude pens are also another favourite of mine. Both offer hard and soft tips, and multiple size pens. I have a stack of each style brush pens and use them often for paper projects. The great thing with these pens, is that you can use them on just about any type of paper. A ream of photocopy paper is really inexpensive and a great way to practice your strokes without feeling like you are wasting paper. This is where I recommend you get started! Gather your supplies and join the 5 Day Challenge and I will walk you through how to start lettering with my next post in this series!! !